[Patrick] met someone, and then some stuff happened. Good for him. Because of this, [Patrick] found himself in need of a pair of engagement rings. With a friend, some titanium bar stock, and an awesome lathe, he turned out a few awesome rings and also managed to selectively anodize them with a subtle rainbow of colors. Making a ring on a lathe is a relatively simple ordeal, but the two larger rings [Patrick] made (one was for a friend) featured some interesting patterns that aren’t easy to make without a good CNC setup. Luckily, this friend has an awesome CNC with a rotary fourth axis. With the machining out of the way, [Patrick] then turned to anodization. This was done by constructing a simple power supply with a variac, four diodes, and a big honkin’ cap. He managed to get a good result with a sodium carbonate solution. He doesn’t have any good pictures of it, but by varying the voltage from 20 to 100 Volts, the color of the anodization will change from green, purple, to yellow, to blue. I want to see someone buy a chunk of created diamond and CNC a diamond ring completely out of diamond. And yes kids, the current Synthetic diamond is the same stuff as real diamond, they perfected the process. De Beers just put a contract out on you. What a waste to destroy such a large diamond to make an ugly ring out of it. Apparently you did not have a big chunk of quartz in your childhood rock collection. Nor some low quality diamond for that matter. Quartz does not shatter on dropping. It does not budge when hit with a hammer even with significant fracturing present beforehand. I have no idea why you think any of these things. It was not a waste of a diamond considering its value, which you lauded in the very next sentence. Finally, a gemcutter’s job is to make the best use of available stone in three dimensional space. Very little of diamonds are usually wasted, but sometimes they can have significant flaws that ruin the value, thus the addition of diamonds in my rock collection as a ten year old. In this case it could have been a big flat rock with horrible flaws in the center, giving the perfect opportunity to make what everyone is thinking but no one has tried. The alternative would have been to cut it up into many smaller diamonds, thus wasting even more of the original stone. The shape makes the difference. A solid chuck of glass or any other brittle material like a quartz crystal is hard to break, since the material compact and well supported. But if you take the supporting structure away, like cut the center out of it, it becomes much easier to break, since the compressive force that acts on a solid body becomes a flexing force (in a solid body, the center takes the compressive force, in a hollow body, the shell is bent, when compressed) that cracks things much easier. Prolly cheaper than a real ring, so less is lost, if the one who Patrick met, is gone. 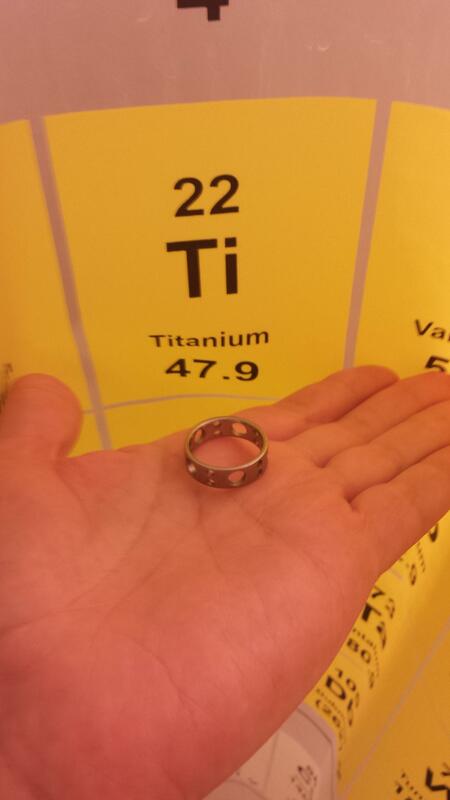 well that’s a pessimistic reason to go for a Ti ring. How about it’s a custom designed ring so it means more and is more special than some massed produced yet expensive one from a store. Hope for the best; plan for the worst. At the very least it’s much more practical to get rings made from relatively cheap material and let the feelings they represent do the heavy lifting. 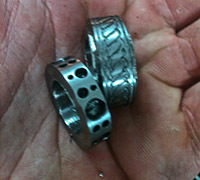 Looks nearly identical to my wedding ring which was CNC’d for me over 10 years ago. by varying the voltage from 20 to 100 Volts, the color of the anodization will change from green, purple, to yellow, to blue. But once you apply a higher voltage, it “overwrites” the previous color. Kinda, at the higher voltages the colors are similar but not the same, there is something a little different about them. I have done this before, a little video from about 7 years ago, sorry, the video quality is total crap. Youtube did something to it a few years ago and the quality dropped in half. Fun fact, you don’t need sodium bicarbonate to anodiaze titanium. You can use Diet Coke and get the same results.